Rye is one of the first things I reach for after dinner but tonight I am again in the arms of the green fairy. Mermaid Ave: pineapple rum, apricot eau de vie, orgeat, lime, soda. The garnish is a mint spring skewered through a raspberry and pinned to an orange half wheel. A sip of Colonel E.H. Taylor, following a recipe of béarnaise. Chartreuse yellow V.E.P. After a cold beef dinner with horseradish I wanted something sweet tonight. From this weekend, a round of Ocean Sides (Tanqueray London dry gin, lime, celery bitters, sea salt) followed by a round of Warday's with Sipsmith London dry gin, Daron XO calvados, Cocchi vermouth di Torino, green Chartreuse (Bartender's Choice ratios). 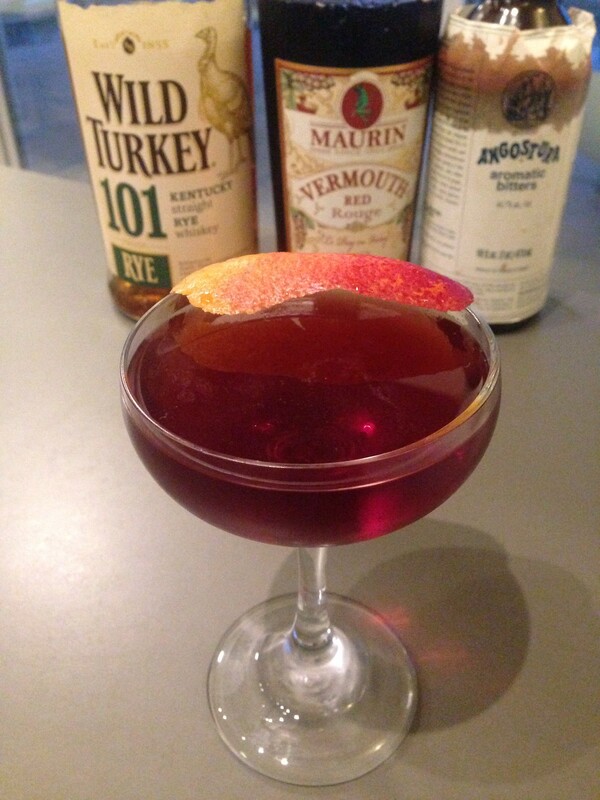 Manhattan with High West Double Rye!, Maurin sweet vermouth, Angostura bitters. 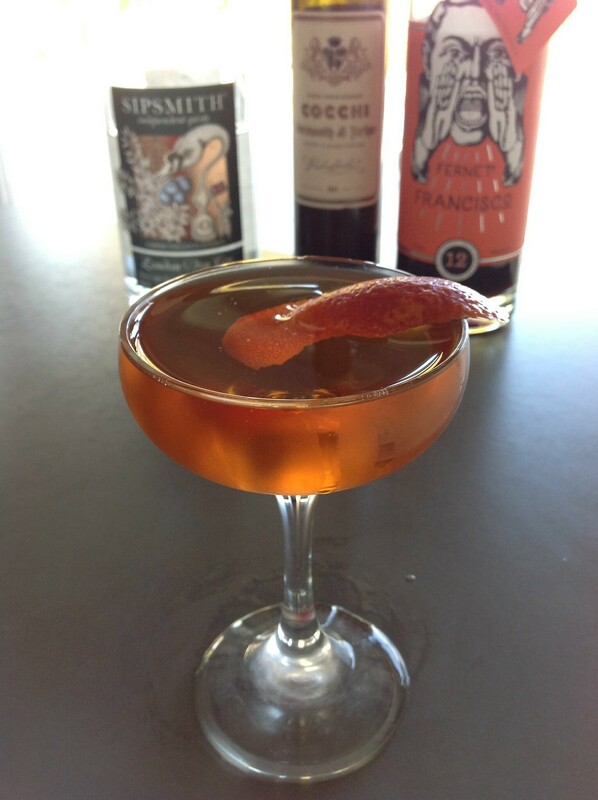 Well, with this vermouth the Manhattan takes a very fruity path. It is different indeed. I thought the fruit in the vermouth would counteract the austerity of this rye, but this was not the most successful union, despite Angostura's best attempts to bring everything together. 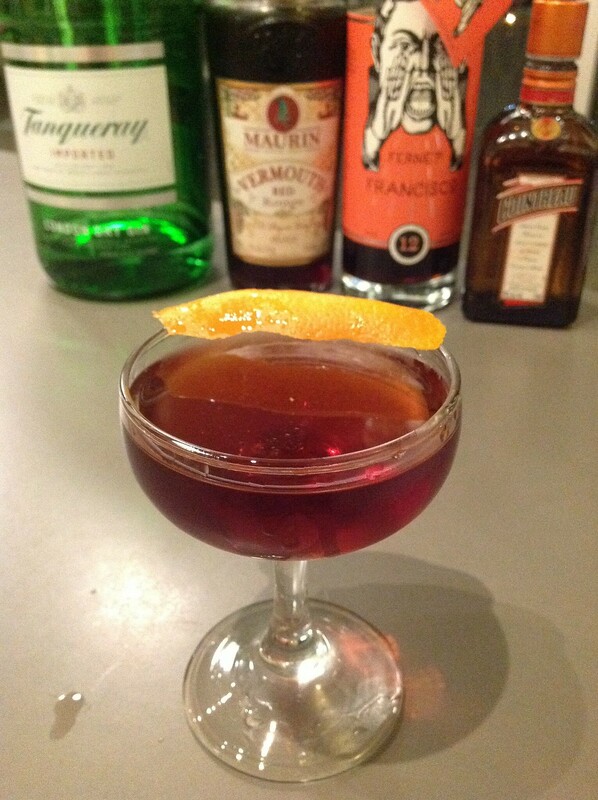 And old favorite, the Don't Give Up The Ship (Crosby Gaige via the Bartender's Choice app) with Tanqueray London dry gin, Maurin sweet vermouth, barrel-aged Fernet Francisco, Cointreau. The Maurin vermouth was very nice in this (and so was the Fernet Francisco). I would discourage you from wasting money on the WT 81 proof rye and go for the 101 (which I know you already have, unless you feel an urge to do it for the sake of cocktail science and compare the two in which case I say go for it!). Don't know why exactly but the proof difference seems really important in terms of flavor with those two. The earlier WT101 was a perhaps even a bit better than the newer 101 that typically only comes in a liter bottle. 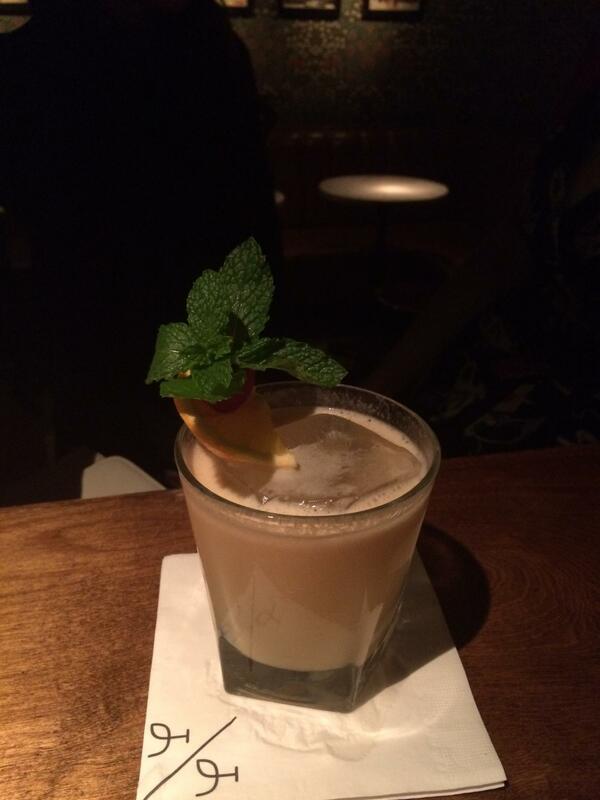 But the current 101 works well in cocktails. Kind of an odd test. If everything was a 2:1 ratio then why are the various pairs done at different volumes in ounces? Wouldn't they all be the same? They only report on about half of the combinations and none of the descriptions note the "quality score". Just whether they were "recommended" or not. Then there is the conclusion: Time and time again, we find that cheaper liquor does not a better cocktail make! Save your money for sipping spirits. And yet the best, and worst, combinations in the minds of the judges (whomever they were. There is no indication as best I can tell) were in the lower price category but mostly lower priced combinations made drinks as good (or slightly better on average based on the slope of the best fit line) as the higher priced combinations. So shouldn't the conclusion be that cheaper liquor can make a cocktail as good or better than more expensive liquor? Although even with that I see possible flaws. It could be that Potrero, being the most expensive but also the most different whiskey in the group, might just not be to the liking of the aforementioned mystery judges (unless combined with the cheapest vermouth apparently!). HW Rendezvous, the second most expensive, is also fairly different from the rest of the pack, having high rye MGP whiskey and older more mature whiskey in the blend than anything else in this group. The other six are far more similar to one another in price, age and mashbill being all low rye content (51% or so) rye whiskies (there are three Beam products at slightly different ages for example but all use the same low rye mashbill). Oh no, of course. I was going to try it with Wild Turkey 101; it would make no sense to downgrade for the 81. I take this with a grain of salt... 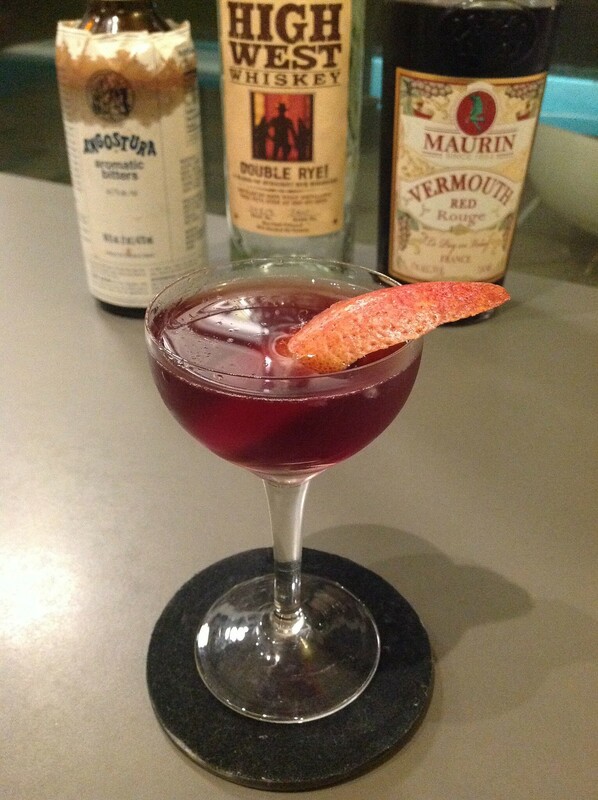 I was just curious to see what rye was recommended by others with the Maurin sweet vermouth, since it seemed to clash with the Double Rye. I tried it last night and I liked it better than the version with the Double Rye. I still don't think it's the best sweet vermouth for a Manhattan, but at least with WT 101 it didn't completely take over the drink. Being a work morn, a caress and cousin's kiss with the green fairy. Not like we got down in the sack or anything. Done a bit of home bottling of booze in the last few days. Applejack is in the freezer to concentrate, and I bottled up a demijohn of mead and a demijohn made from white grapes from a neighbour's polytunnel. And then this morning I finished off Prunes in Armagnac from this recipe http://chezpim.com/drink/pruneaux-larmag . We will see how long I can resist giving it a taste! A Ti Punch from last week. Apparently March 16 is National Ti Punch Day. I had no idea! Some nights it is so hard to choose: a simple glass of Whistlepig. To cut the olive oil and fresh pressed garlic. Before dinner was a zombie. The grapefruit in the bedroom are rotting and coming back to life. I've taken to reversing Don's proportions of grenadine and falernum with good results. 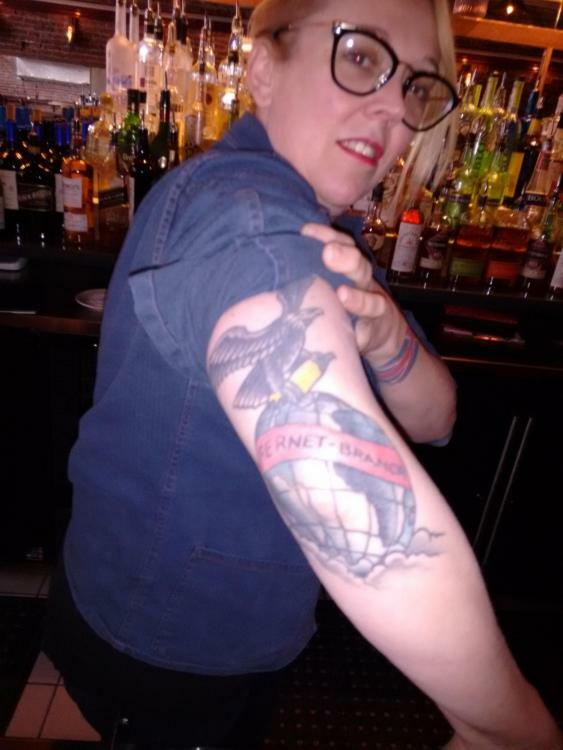 How to recognize a good cocktail bar: when you ask for shots of Fernet and the bartenders join you. But the highlight was my Tyrone with scotch, banana liqueur, egg white, something else that I forget (my photo of the menu didn't turn out) and stout garnished with nutmeg. A flip for people who would freak at egg yolk. For my second drink, I asked for something with Smith and Cross and got a tiki-esque drink with a nice punch that they were working on. I think I'm slowly converting my wine-drinking cousin and her boyfriend. All this and more could be yours at Quarter and Glory in Washington DC. New enough that they don't serve food yet. They are off to a great start. 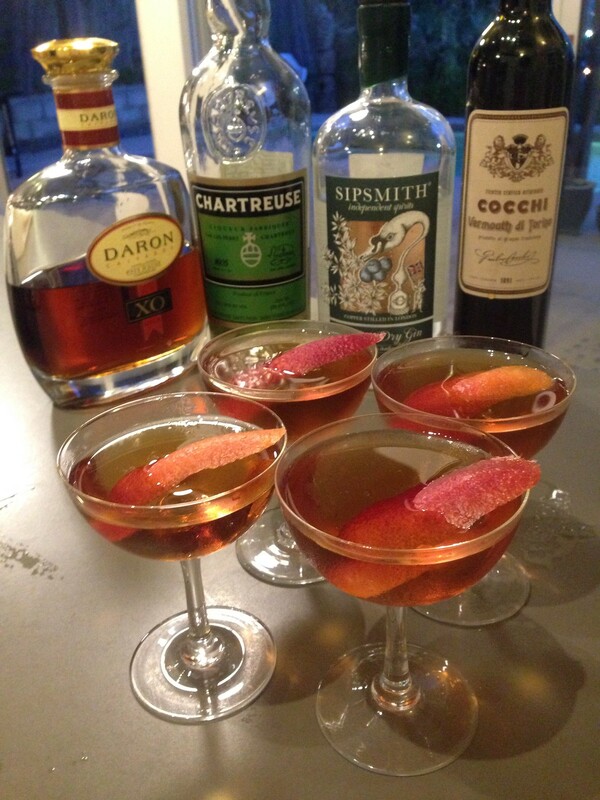 From last night, one of my favorite cocktails, Ada Coleman's Hanky Panky (with PDT ratios) with Sipsmith London dry gin, Cocchi vermouth di Torino, barrel-aged Fernet Francisco. The Fernet Francisco has considerably less menthol than the Fernet Branca, and more caramel. After an overly rich repast (I'm getting quite acceptable at panfrying steak and I've always been pretty good with hollandaise) I thought to try the rye one Froggy posted...what was it? Train Wreck? Let's see...Workers on the Tracks! I have all the ingredients. But I went with an old favorite classic beverage, Balaclava #1. And since it's assembled and served in a wine goblet, there is nothing extra to wash or clean up. Eco-friendly. 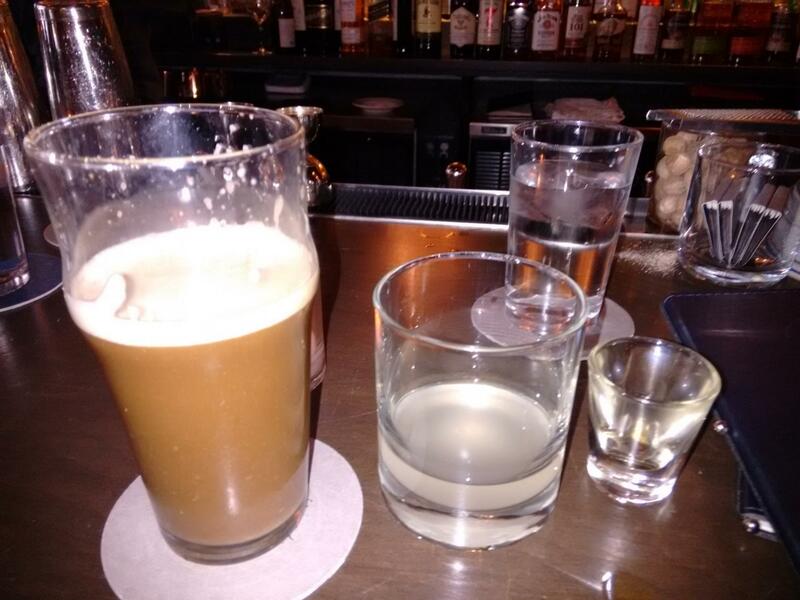 Before dinner last night: The Ninth Ward and Corn 'n Oil. Saw Cruzan Blackstrap on sale at the liquor store so I thought I'd retry the Corn 'n Oil, which didn't impress me much when I tried it in the past with other dark rum. I'm still kinda meh on it. Ninth Ward is a pleasant tipple, tiki-ish flavors (lime, falernum) and New Orleans-ish flavors (whiskey, Peychaud's) married with "ketchup" (St. Germain). After dinner last night: Cynar Flip and Blackstrap Cynar Flip. Since I had the Cruzan on hand I offered the Blackstrap version for guests interested in cutting bitter and boosting sweet. But for myself I stuck to the original Cynar+egg version--rich, creamy, caramel-y dessert. Brunch today: Juice of a Few Flowers and For a Few Flowers More. Will pre-squeeze and batch the juices (grapefruit, orange, lemon, lime). 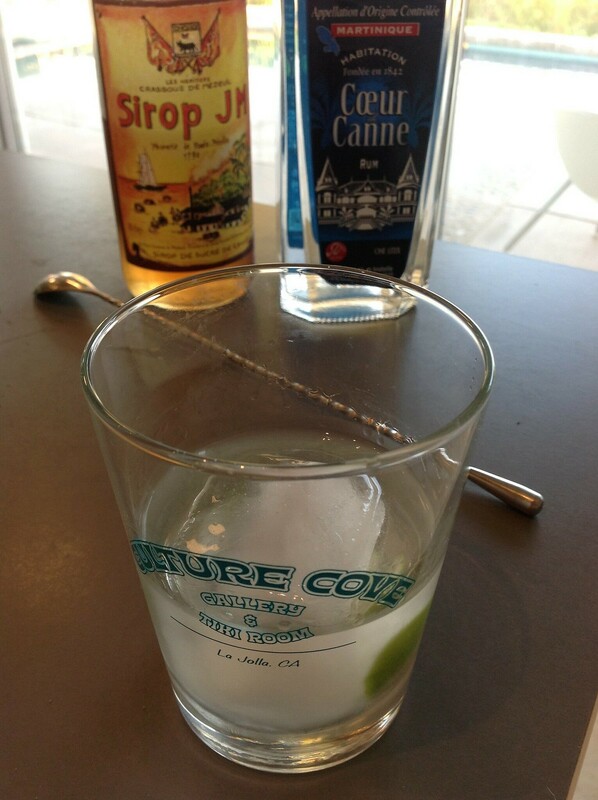 Sugar the rim and add gin for the former; Add rum and falernum for the latter. Should be an easy serve and a great brunch drink, especially for a group of fellow art historians (the original recipe is taken from the papers of Jazz-age painter Gerald Murphy). After dinner just a generous glass of Glendalough mountain strength poitin. It seemed so right some how. Had the pleasure of hosting a Compass Box dinner late last week with Mr. Compass Box himself, John Glaser! Had a great evening talking whisky with John but just now getting around to posting about.